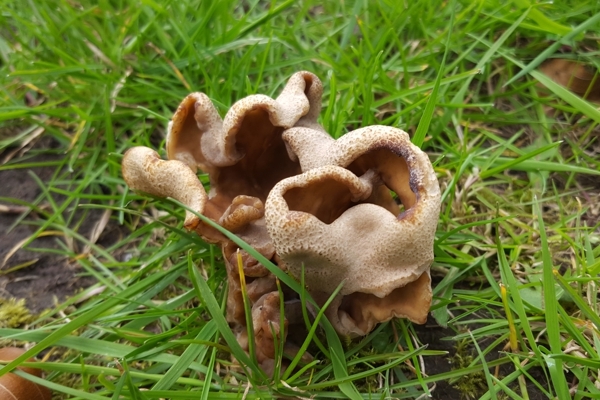 Continuing my mission to improve my knowledge of fungi, I have been searching for spring fungi. I had a look in an old orchard, which some books say are potential sites for morels, and I found this large brown fungus growing beneath the trees. It’s colour made it quite well camouflaged against dried-up leaves. I believe that this is bleach cup, which gets its name from the smell of chlorine that is produced when it is rubbed or broken. 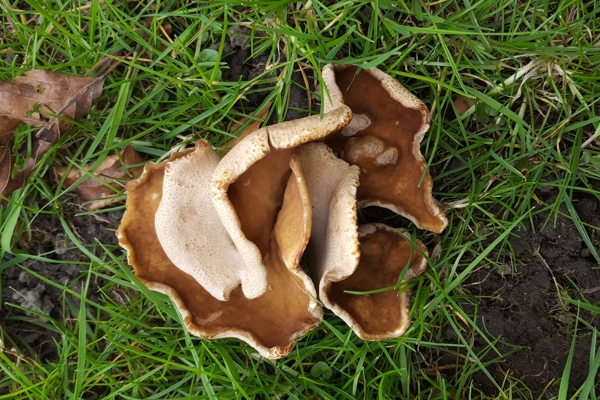 This fungus is one of the Ascomycetes and it is quite closely related to the morels but there are conflicting opinions about whether it is edible. The peregrines remained on the cathedral throughout the winter, holding onto their nest site and chasing away intruders regularly. They have spent recent weeks preparing to breed by carrying out ledge displays and making a nest scrape. 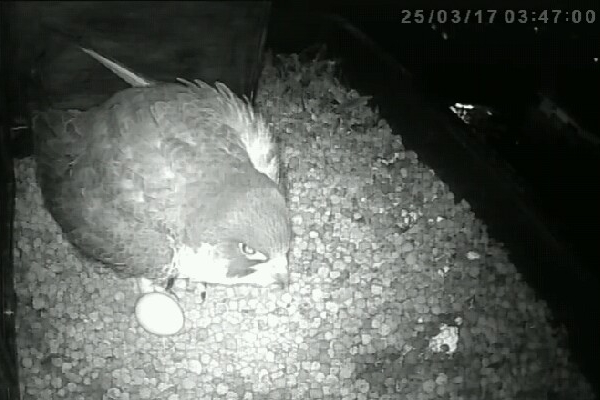 First sighting of the new egg. 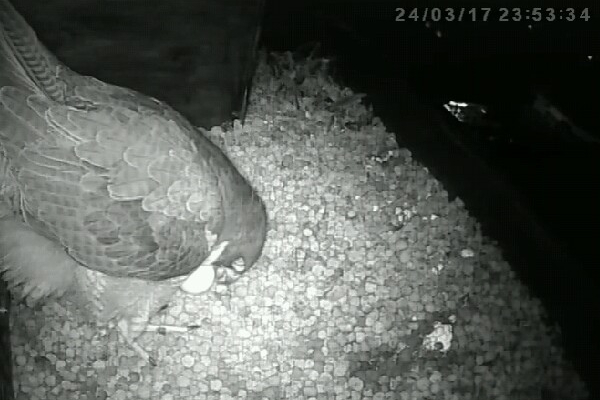 Last year’s first egg appeared in the early hours of the 25th March and the female has been remarkably true to this day by laying her first egg of 2017 late on 24th March, not long before midnight. A watcher in Texas saw when the egg was fully uncovered for the first time and I wonder how many other people were watching in countries around the world. 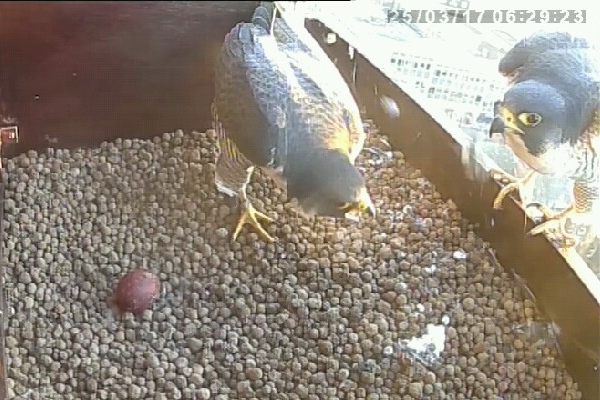 It was daylight when the male got his first look at the egg but the female soon arrived to keep her eye on it. We expect eggs to be laid every two and a half days, approximately, until there is a clutch of three or four. The female will start to incubate when the penultimate egg has been laid. It’s still quite early in the year but three large grass snakes (Natrix natrix) were seen recently at Stanley Ferry Flash. These snakes must have emerged from hibernation recently. Grass snakes often live in marshy places or near lakes and ponds, where they hunt for amphibians. They lay eggs amongst rotting vegetation, where the heat produced by the decomposition of the vegetation keeps the eggs warm. They may, therefore, sometimes make use of compost heaps for egg-laying. In addition, the first cowslips (Primula veris) are now flowering at Stanley Ferry. I very occasionally see woodcock flying at Ackworth at dusk but I don’t usually get a good look at one. 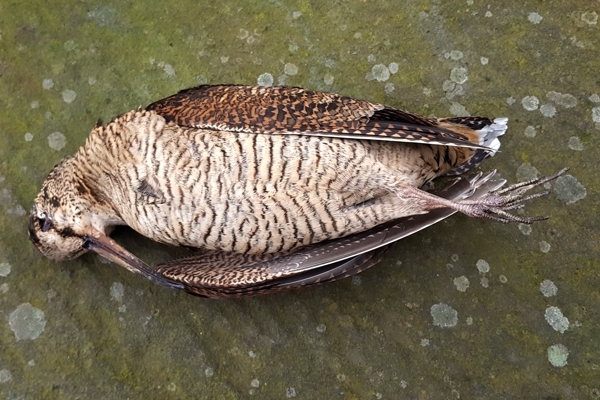 This week, students in the junior school found this bird lying dead after it had flown into a window. 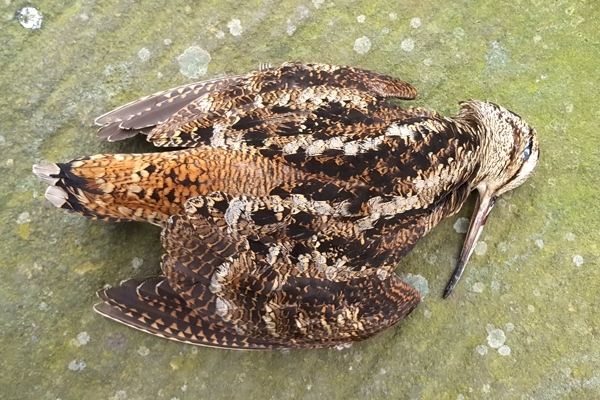 During the daytime, woodcocks sit motionless on the ground and their plumage makes them perfectly camouflaged amongst dried leaves and twigs. Woodcocks are native to the UK but most of the birds present during the winter months have arrived for the winter from Scandinavia or northern Russia.